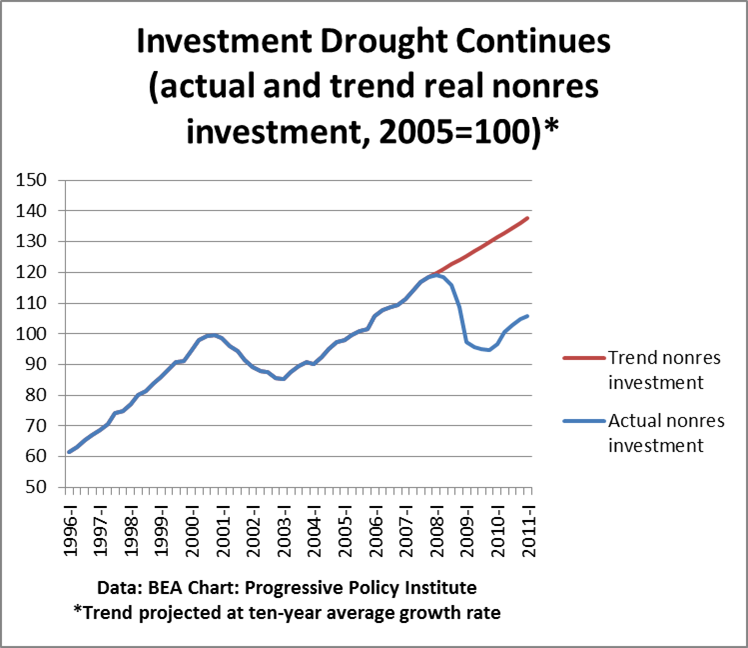 As of the first quarter, real nonresidential investment is 23.1% below its long-term pre-crisis trend, slightly wider than in the fourth quarter of 2010. 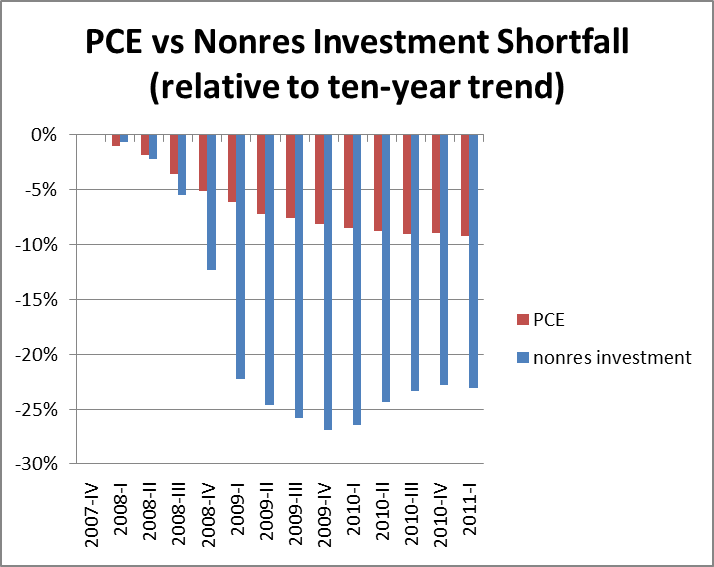 This is the clearest sign of the weakness of the economy, since no one can argue we had a bubble in nonresidential investment before the crisis started. 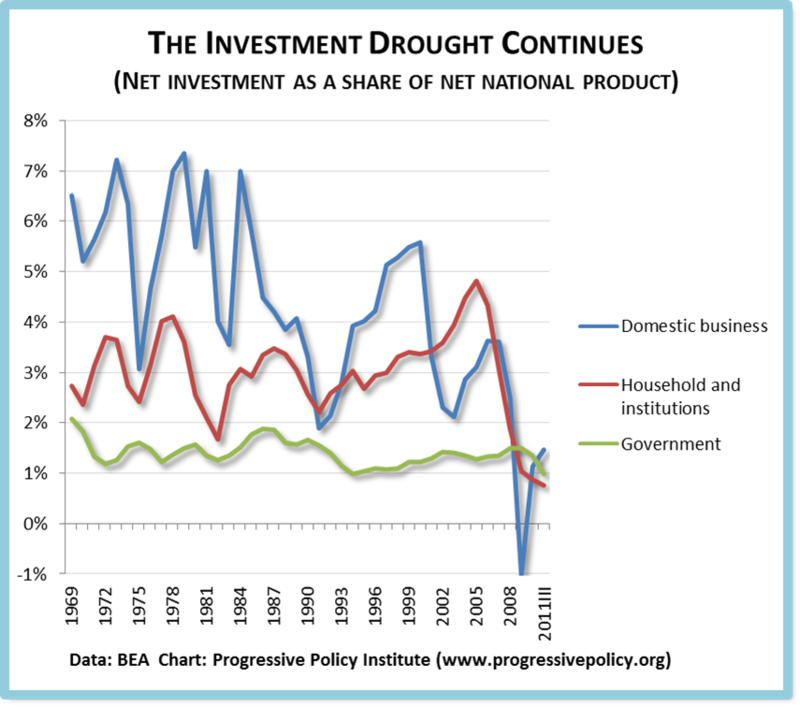 The longer this investment shortfall last, the harder it will be to recover. The consumption shortfall is only 9.2% relative to the ten-year trend. 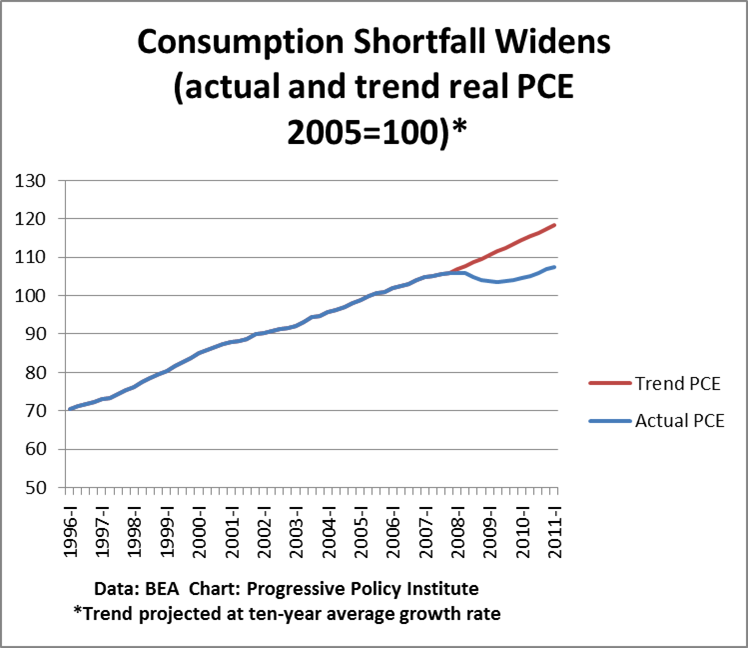 That’s widening too, as real PCE growth is still below the long-term trend. However, given the fact that the U.S. was supposedly over-consuming before the crisis, a 9.2% shortfall may not be big enough! Back in January, I promised to start running lunchtime events on interpreting economic statistics in the new global economy. Dr. Michael Mandel will lead a lunch forum for journalists and policymakers to discuss key trends in U.S. and global savings and investment, with the goal of identifying potential story ideas and policy opportunities. Topics will include why investment in physical, human, and knowledge capital is essential for the future of the U.S. economy, and an examination of why the government data measuring savings and investment are woefully incomplete and misleading. Dr. Mandel is a senior fellow at the Progressive Policy Institute, formerly award-winning chief economist at BusinessWeek. Strictly limited seating. One unpleasant surprise after another, from the top down. *The age of the residential stock is at its highest level in 40 years, despite the mammoth building boom of the 2000s. 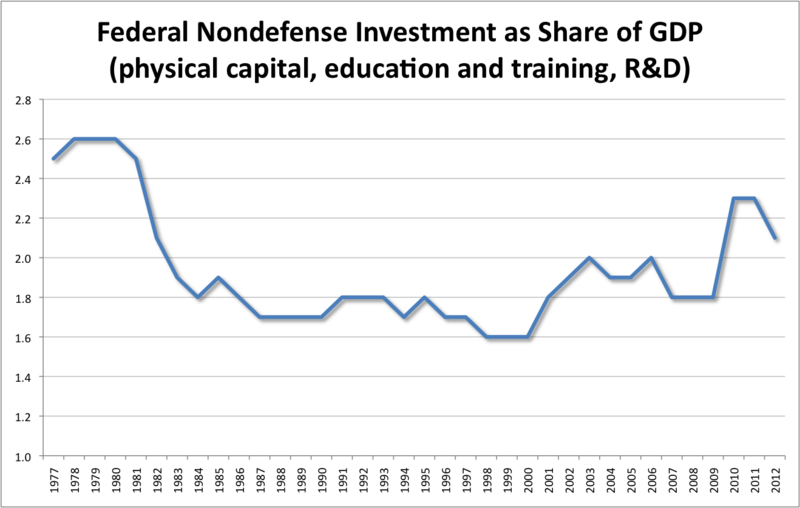 *The age of the government capital has steadily risen over the past 40 years, suggesting great underinvestment in public infrastructure. *The age of the private nonresidential capital stock has risen more or less steadily since the early 1980s, with a slight dip in the New Economy boom of the 1990s. Let’s break it down by industry. 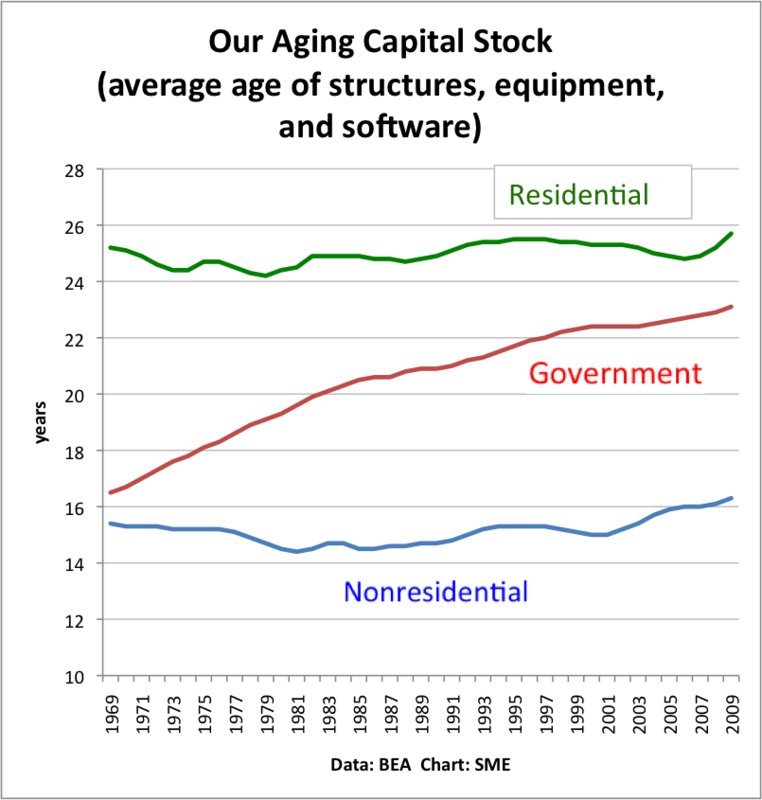 This chart shows the change in the average age of the capital stock since 2000. It’s kind of an odd and surprising picture. 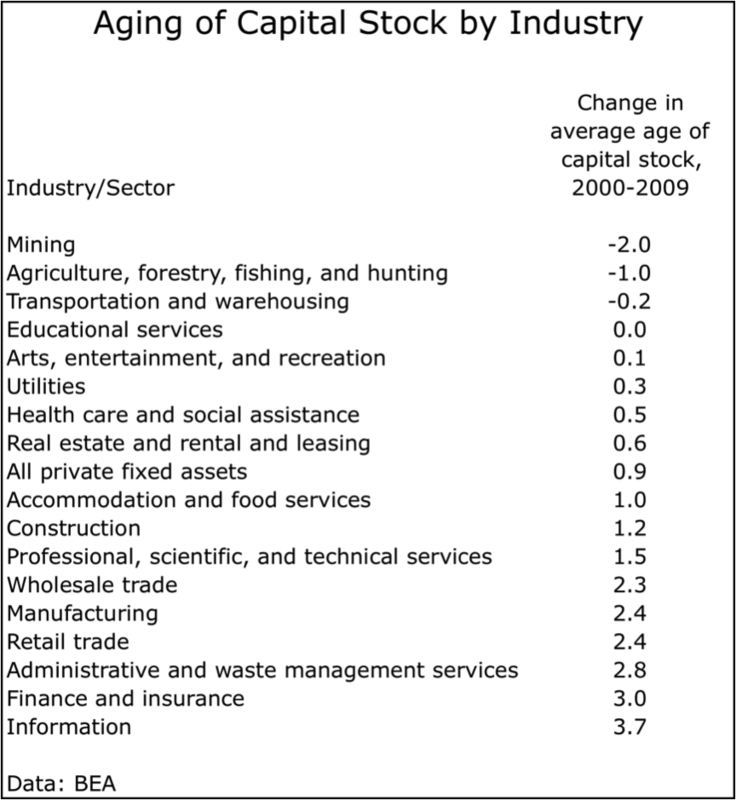 The sectors which got younger were mining, farming, and transportation. The information sector, which was supposed to be leading the economy, had the biggest rise in average age. That’s because we just weren’t investing enough in information technology over this stretch to make up for the aging of the old physical infrastructure. Here’s a chart that to me sums up the past decade. This was supposed to be the Information Revolution…but what we mostly did was build homes. Private fixed assets are things like machinery, computers, factories, power plants, housing–all the privately-owned productive assets of the country. From 1999 to 2009, the real net stock of private fixed assets grew by 26%, the slowest 10-year increase in the post-war period, according to data from the Bureau of Economic Analysis. That slow growth in real private fixed assets is bad enough. 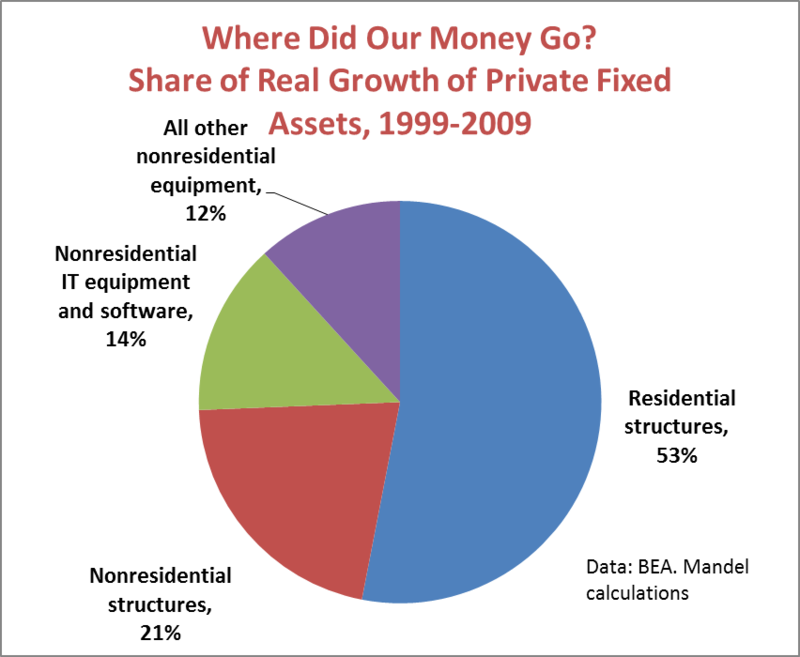 What’s worse, housing accounted for the majority, 53%, of the real increase in private fixed assets. By comparison, information technology equipment and software–computers, software, and communications equipment–only accounted for 14% of the increase in productive assets. If we toss in spending by on ‘communications structures’, that gets us up to 16%. In any case, the net real increase in housing fixed assets was more than triple the net real increase in IT fixed assets. That may help explain why we are in such dire straits now—plenty of new homes, not enough investment in IT. That’s why I’m not terribly concerned about the slow pace of recovery in the housing market. I’d rather see money go to more productive uses. Some caveats: This analysis does not include government assets or consumer durables.